Watch As The Nor'easters Deliver A Jaw-Dropping, Stunning Vocal Performance In New Video For "Too Good"
The Nor'easters have stolen our hearts once again, and this time it's all thanks to Drake's "Too Good." 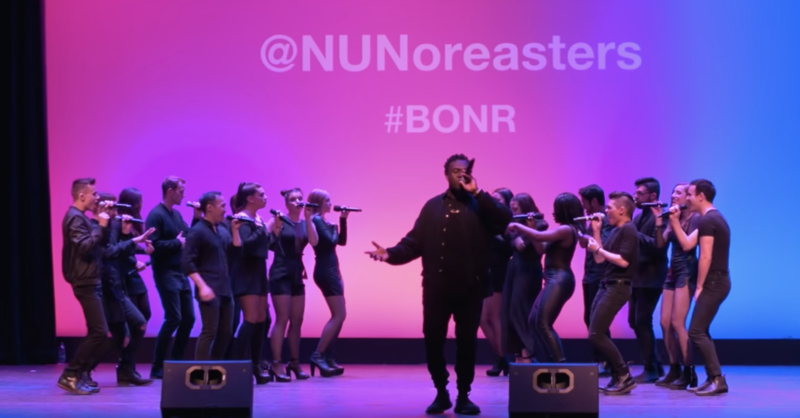 This past Friday, the coed a cappella group from Northeastern University dropped another banger with a bass booming, artistically stunning Drake cover that's simply majestic. We're not sure how the Nor'easters do it time after time, but the talent of this group is a driving force behind their consistency. For starters, the energy of the group in "Too Good" is simply off the charts. This is due in part to the pristine audio production provided by The Vocal Company. In that same vein, an abundance of credit goes to Shams Ahmed for the immaculate arrangement, which does so well at highlighting each vocal part, while simultaneously leaving you in eager anticipation for the song's next big movement. But of course, none of this is possible without the sheer vocal force of the Nor'easters. The group's ability to take a hit hip-hop track and vocally deliver an energetic, nuanced and stylish performance, and have it feel like a vintage Nor'easter song is beyond extraordinary. The lead acts of Aanu Fawole and Claudia Moericke compliment each other extremely well, with each being able to shine when the spotlight is squarely on them. Fawole's bass vocals are gooey, captivating and powerful, while Moericke's pop-like higher register adds the necessary flair to make the performance feel complete. And the two literally had us falling out of our seats when they begin harmonizing on their runs. And let's not forget the backing vocals of the Nor'easters. There are very few groups who can precisely function as one unit in the way that the Nor'easters do. From their blend, to their pacing, to dynamics, it's incredible. And the swells at the end of "Too Good" are what legends are made of. See what we mean in the video below.